This house was built in 1890 for Joshua B. And Mary A. Tufts. The Tufts were some of the earliest residents of Yolo County, arriving in 1850. Joshua Tufts served on the Yolo County Board of Supervisors from 1853-1875. Joshua B. Tufts, of Middlesex County, New Jersey, married Mary A. Kingsland, of New York City, in 1845. The day after their wedding, April 24, 1849, they boarded a ship for a six-month honeymoon that took them around the Horn. After finding San Francisco real estate too expensive, the Tufts moved to Sacramento. He opened a retail store in Sacramento then moved to Yolo County in 1850 and established a hotel in Washington. He developed a profitable truck garden and invested in Jacob Lewis’ Ferry and the Yolo Plankroad Turnpike, an early toll road chartered in 1855. After serving on the second and third county board of supervisors, he bought 500 acres on the south bank of Putah Creek and established orchards and truck gardens. Over the years that he owned the property, a hotel, livery stable, blacksmith shop, general store, and the Solano Post Office were built. Joshua and Mary had ten children, three of whom died in infancy. Their adult children are: George, Charles, Lucy (who married George B. Hoag), Dollie (who married Charles Philliber, and after his death, Calvin A. Covell, Jr.), Andrew, William, and Belle (who married an Agler). The architectural style is Victorian, though not as flamboyant as may be seen in Sacramento or the San Francisco Bay Area. Distinctive details consist of fan brackets and pendils at corner eaves, fish scale shingles, bay windows, and worked/turned wood motifs. Elements of the Stick Style are borrowed in the stick-like gable braces and the decorative stick members suggestive of the interior framing structure. Bays project out everywhere. There are squared bays and slanted bays. Looking straight on toward the entrance facing J Street, the house moves back by a series of steplike movements. In addition, the main roof has a basically hipped quality with secondary gable roofs on the bays intersecting the whole and creating an interesting array of angles. The veranda or porch is typical of the Eastlakeand Stick Styles. The railing is non-decorative, however, the porch columns are very decoratively turned. Notice the unusual placing of the steps offset from the main entrance. 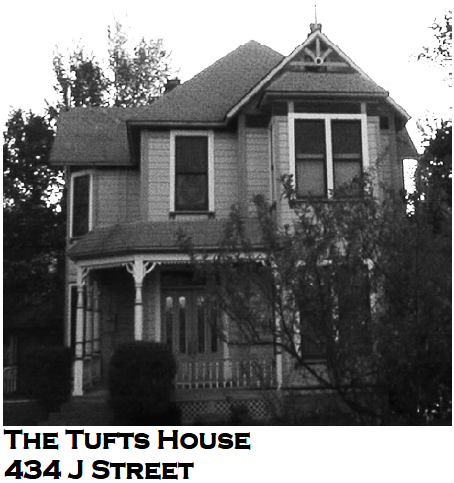 What has happened since the Tufts’s lived here? Preceded in death by his wife, Joshua Tufts lived in this house until he died in 1914. The house passed through various ownership, and was converted into two apartments, one upstairs and one downstairs. A kitchen was added upstairs. The house was bought in 1962 and became the Longview School, To meet the needs of the school, a downstairs bathroom was added and brick work was done on the foundation. The house became too small for the school and in 1971, Longview School moved to a new location. In 1971, Valerie Jones bought and renovated the house. The house is listed on the National Register of Historic Places Inventory.